Best Moss Removal and Treatment. Save money. Save replacing your roof. Best Moss Removal Process to Extend the Life of Your Roof! Immediate, same day results that Save You Money and the hassle of replacing your roof investment with our professional moss removal and treatment process. Trained and certified under the Sullivan Roof Cleaning system, we take optimal care on site using safety equipment and coverage. If you’re thinking of selling your home, put perspective buyers minds at ease with the best moss removal system available. We remove moss, mold, fungus and lichen that are eating away at your roof adding years to your roof. Using a low pressure, low impact Softwash system, we can make your roof look brand new again the same day we visit. No waiting! 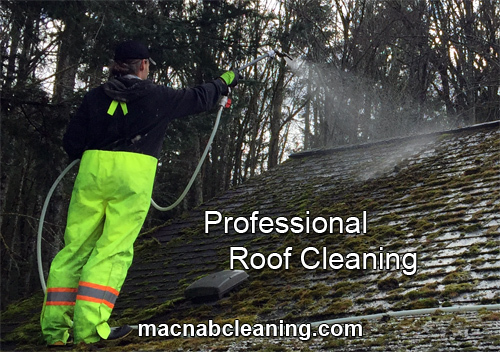 Before we start we will inspect the roof or surfaces which need cleaning. We take care in using safety equipment and ladder standoffs so none of your property is damaged. We will clear the larger debris with blower, brooms or by hand. If gutters need cleaning we will do that as well. Environmentally friendly solution is mixed by us and applied to all surfaces requiring cleaning. Neutralizing the moss allows the roots to let go of the shingles minimizing any damage. Ripping or forcing moss off of shingles with tools or high pressure increases the likely hood of more roof damage. Our solution needs only 20 minutes to effectively neutralize any infestations. After the treatment has set we use a garden hose to rinse off shingles. We do not use a pressure washer for roofs. This can damage your shingles as will sharp tools. We will only use a pressure washer on non roof surfaces. A final rinse down of the property, plants and cleaning of any loose debris before we leave. Improve your home’s curb appeal in one day!